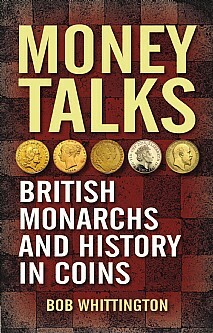 Money Talks is a fast-paced history of the humble British coin, the events which at times literally shaped it and the stories reflected in its creation. It has been used to barter and to bribe, to hold a cloak in place and to pay a king’s ransom, been an object of pride and a symbol of courage. The coin has witnessed the great events in history – about kings and queens and the transfer of power – and it speaks to us of generations passed, of battles and heroic deeds, of countries and empires as well as of moments we would rather forget. Money Talks is about how such a small object of desire has been regarded as a symbol of power and authority for more than 2,500 years. It traces British history through the one thing that has come to dominate our lives – hard cash – and it demonstrates how monarchs down the centuries have used it to fund their wars, maintain their lifestyles and portray their image to prove their position or legitimatise dubious claims to the throne. From time to time the coin has slipped out of use altogether as bartering goods was preferred to poor quality coinage for day-to-day business. It has been hoarded for safer times and simply used as adornment. But even as the modern world turns increasingly to electronic transactions moving billions around the world at the touch of a button, the coin retains its place at the heart of everyday life. This will be a source of fascinating information for anyone interested in British coinage and British history.